All rights reserved. This document is a product of the staff of the International Service for the Acquisition of Agri-biotech Applications (ISAAA) South Asia Office, New Delhi. Whereas ISAAA encourages the global sharing of information, no part of this publication shall be reproduced in any form or by any means, electronically, mechanically, by photocopying, recording or otherwise without the permission of the copyr ight owners. Reproduction of this publication, or parts thereof, for educational and non-commercial purposes is encouraged with due acknowledgment, subsequent to permission being granted by ISAAA. Correct Citation: Choudhary, B. and Gaur, K. 2009. 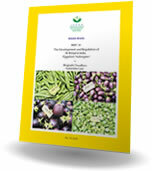 The Development and Regulation of Bt Brinjal in India (Eggplant/ Aubergine). ISAAA Brief No.38. ISAAA: Ithaca, NY.